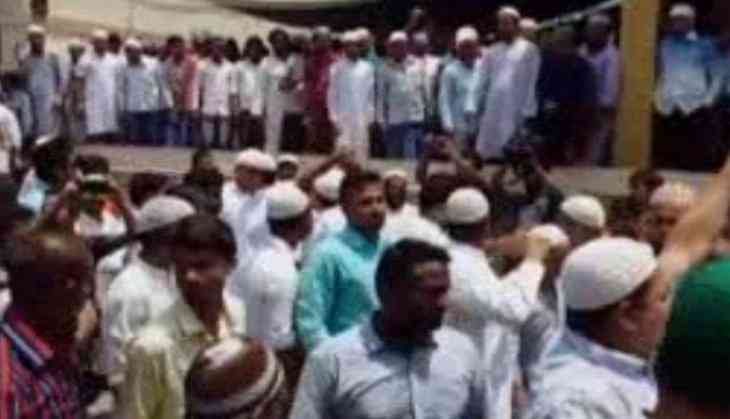 Chaos prevailed outside was here on Friday the Tipu Sultan Masjid when a group of men said that they won't allow Imam Syed Noor-ur-Rehman Barkati perform the namaz. The controversial Imam Barkati was sacked from the position of Shahi Imam of the Tipu Sultan Masjid earlier this week. Today, he was allegedly attacked by a protestor who demanded that he vacate the masjid. "Someone hit me from behind on my head. I suspect the Rastriya Swayamsevak Sangh (RSS) is behind this attack, as they are taking advantage of the situation created by the masjid committee," Barkati told ANI. Barkati said he was attacked for raising his voice against the injustices being done and warned the RSS not to indulge in such dirty games. "This happened because I raised my voice for what is right and for justice. I just want the law to take its course. I have been humiliated a lot today," he said. Imam Barkati is infamous for issuing fatwa against Prime Minister Narendra Modi and defying the Centre' order on the use of the red beacon.